The Monmouth County Special Needs Registry is a voluntary service open to all citizens who reside, attend school or are employed in Monmouth County that are affected in some way by a disability. More specifically, the Monmouth County Special Needs Registry is a database maintained by the Monmouth County Sheriff’s Office and the Monmouth County Prosecutors Office that contains profiles of registrants with disabilities. The information provided to the registry provides law enforcement and other first responders with vital information about a registrant’s special needs in the event of an emergency. Who has access to the registrant’s profile? Information provided to the registry will only be shared with first responders during an emergency or for the purpose of planning an emergency response. An emergency can best be defined as any event that may require a response, immediate or otherwise, by law enforcement or other first responders. Examples of emergencies include but are not limited to medical emergencies, natural disasters, fires, mandatory evacuations and crimes in progress. How will the information contained in the registry help a person with special needs during an emergency? The information contained in the registry can help in several different ways. Upon being dispatched to a residence, police dispatchers will be made aware that someone at that location is on the registry. Depending upon the type of call, the dispatcher can better assess the type of response necessary and dispatch manpower and resources accordingly. Also, police officers and/or first responder will be notified that there may be someone at the location with special needs so that they can better gauge their respective responses. In the event that a person with special needs is reported missing, first responders will have current photographs and other vital information at their fingertips that will aid in locating the missing person more expeditiously. In an emergency, time is of the essence. What information is required to register someone? There are two types of information on the registry, mandatory and non-mandatory. Mandatory information includes the registrants name, address, emergency contact information, nature of disability and a current photo. Non-mandatory information includes prescribed medications, doctor information and blood type. It will be up to the registrant as to how much of the non-mandatory information they wish to share. The registry is open to any person who has a physical or mental impairment that substantially limits one or more major life activities due to a physical and/or intellectual disability. A person can register themselves or they can be registered by a caretaker or loved one. An application for the registry can be filled out and submit online here. No, there is no cost at all to register for Monmouth County Special Needs Registry. Where should I place my SNR decal on my car? 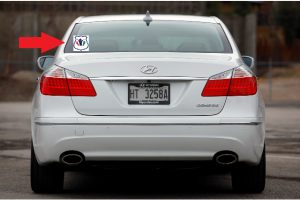 The best place to put your decals are on the rear drivers side areas of the car, the pictures below provide an example. 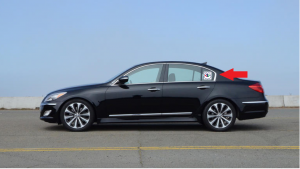 Decals are NOT to be placed on the front windshield or on the side windows, which when rolled down will cause the decals to come off. 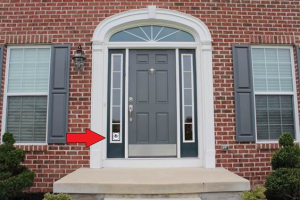 Where should I place the SNR decals on my residence? 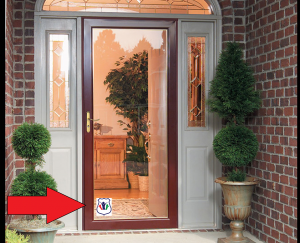 The decals should be placed conspicuously on any glass surface at the front entrance of the residence. Who should I contact in the event that I have a technical problem with the registration process? You can email helpdesk@mcsonj.org and put Special Needs Registry in the subject line. Who should I contact in the event that I have a question about the Special Needs Registry? You can call (732)431-6400 ext. 1188 or contact your local police department for assistance. If you change your email address, please send an email to helpdesk@mcsonj.org or call 732-431-6400 x1600 and provide us with your old and new email address so we can update your account and ensure that your existing registrations are connected to your new email address. How do I update a Special Needs Registrant’s Information? On this Website, Click the Log In link in the upper right hand corner. When You Click the Edit/View button below step 3, If you have a registrant(s), it will list them here. You have 1 registrant(s) registered with the Monmouth County Special Needs Registry. Use the edit button below to change a registration and update the database. If I click the Edit button, it brings you to Step 1 of the record where you can begin reviewing and changing information and click next on each page until you get to the end. After you click Update, You will get a message the says “Your submission was successfully saved” There is a link under that message to return to the Registration Page where you can return to the main page to add or edit more registrants.